Gallery / Saga Press, 9781534431003, 208pp. 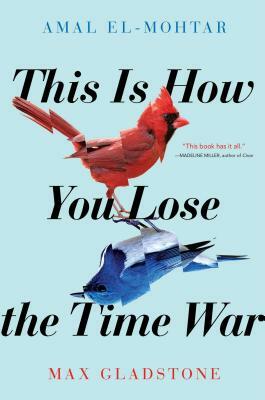 Cowritten by two beloved and award-winning sci-fi writers, This Is How You Lose the Time War is an epic love story spanning time and space. Amal El-Mohtar is an award-winning author, editor, and critic. Her short story “Seasons of Glass and Iron” won the Hugo, Nebula, and Locus awards and was a finalist for the World Fantasy, Sturgeon, Aurora, and Eugie Foster awards. She is the author of The Honey Month, a collection of poetry and prose written to the taste of twenty-eight different kinds of honey, and contributes criticism to NPR Books and The New York Times. Her fiction has most recently appeared on Tor.com and Uncanny Magazine, and in anthologies such as The Djinn Falls in Love & Other Stories and The Starlit Wood: New Fairy Tales. She is presently pursuing a PhD at Carleton University and teaches creative writing at the University of Ottawa. She can be found online at @Tithenai. "This book has it all: treachery and love, lyricism and gritty action, existential crisis and space-opera scope, not to mention time traveling superagents. Gladstone's and El-Mohtar's debut collaboration is a fireworks display from two very talented storytellers."